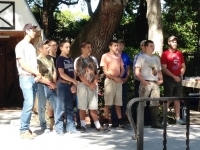 A report by Ellen Magnuson on the Gator Wilderness Boys Camp event. First, some things you need to know about the year-round Gator Wilderness Camp School east of Punta Gorda. It all began with the Camp Director and Founder Greg Kanagy when he realized there were troubled boys in the area that needed help. He, along with others, made a plan to help them. The Gator Wilderness Camp School is the result. Each boy was, and still is, interviewed one on one by Greg Kanagy. Prior to acceptance, none is compelled to enroll by either parents or authorities; of their own FREE WILL, they admit themselves. The SBCC invited a group of nine Gator Boys to come and picnic with us, then view the automobiles and cast a vote for the car of their choice. The owner of the car would receive a new trophy award. It is to be awarded annually by the boys, and called; The Peter Clark Trophy, Help Yourself to Help Others. For those who knew Peter, before he had to leave Florida for the last time this year bound for his home in Northern England, agreed it is very aptly named. Now to the event … At 10 A.M Saturday October 18. Twenty-one SunCoast British cars started to arrive at 4120 Camino Real. The Magnuson oldies were already positioned making 24. Each car reflected the warm autumn sun in it’s gloss as they were arranged expertly around the front lawn expertly by Russ Lukin. I suppose I should mention the two Magnuson German VW vehicles that were already illegitimately in place. We had to put them out because they pout with jealousy and refuse to start if we leave them garaged on such occasions. With these two reprobates, the count went up to 26 cars. However, the Germans were exempt from the judging. The nine ‘Buccaneer’ Gator boys arrived in their van as planned about 11:45 A.M. They are the middle group of boys, 12-15 years of age, and were accompanied by their Chiefs, Ben and Cory. First order of business was for everyone to eat. Yum Yum … Then the young judges did the rounds. It took at least an hour for the Gator’s to scrutinize each car with eyes alight with enthusiasm. They walked slowly, talking with owners and asking questions, with permission they even sat inside the gleaming beauties. All this activity provided a photo-op. for son Peter’s wife T.J.. She had jumped at the chance to bring her camera when father-in-law Duane M. asked if she would. Things moved along and the boys sang songs for our entertainment. After which they introduced themselves and said a few words. Chief Cory asked our club members if there were any questions and the response was immediate. About twenty minutes of Q&A followed. Our club asked many good questions about the camp and its 30 young occupants. We heard about swimming, planting food, studies, activities, skills, training and trips etc.. Even designing buildings, cutting down trees to supply wood to build primitive open-air covered huts where they cook, live, and sleep. They do have a professional communal center where they eat evening meals, share camaraderie, and receive discipline. Cory told us that the boys are not allowed to retire at night if there are problems between them. They stay up regardless of the hour until things are settled. Bedtime can be very late sometimes! He went on to tell of excursions, like the 10-day canoe trip the older group were already on along the Peace River. He invited us all to The “Turkey In The Hole,” an annual event coming up soon at Gator Camp. One of our members asked how many attended and Cory said it went from 300 in 2012 to 600 in 2013. To close he asked for a word or two from the boys themselves. Each gave his name and one or two did add comments. Lastly, according to Gator tradition and prompted by Chief Cory, they loudly shouted their appreciation for the food. At 2: 40pm, the perfect day was over. Our group gathered round for handshakes and slaps of ‘well done’ on their young backs. Chief’s Ben & Cory loaded the boys into the Gator van, took their seats up front, and with a wave pulled out of the driveway. There was a happy face at each window. We want to give thanks to our Lord and to all our fellow car club members who polished and drove their treasures to 4120. Thank you especially for the warm reception you gave the boys. It revealed not only your care and interest in old cars, but your care and interest in troubled young men as well. Thank you ladies, for the many tasty dishes and willing hands to help arrange them on our make-shift saw-horse and wood planked table under the oak trees. Every dish went perfectly with the hamburgers and hot dogs, and the deserts … well … they were … dare I say it … yummy. Thank you also to our son Peter, for bringing his two outdoor grills and willing hands to roll dogs and toss hamburgers over heat on a warm day. He admitted that he got hot enough to jump into the ice chest but he said he enjoyed everything “like mad” and wouldn’t have been anywhere else. Everyone left, and we finally packed our stuff into the garage. We were on our own and daylight was waning when we finished. It seemed to us that the garage doors and the sun went down together. What fun to reminisce how the Gator boys enjoyed themselves and how they shouted loudly in unison their traditional appreciation of food.